Man oh man. Did I save the best of my giveaways for last this week. We have an opportunity for one (1) lucky ScreenAnarchy reader to win a Bone Tomahawk poster signed. By everyone. Okay. Mostly everyone. The poster is signed by only Kurt Russell, Patrick Wilson, Matthew Fox, Richard Jenkins, S. Craig Zahler (writer/director), Dallas Sonnier (producer) and Jack Heller (producer). Still. I do not think I have given away a poster signed by as big of a cult icon like Kurt Russell. I expect my inbox is going to be rammed once this contest goes live. When a group of cannibal savages kidnaps settlers from the small town of Bright Hope, an unlikely team of gunslingers, led by Sheriff Franklin Hunt (Kurt Russell), sets out to bring them home. But their enemy is more ruthless than anyone could have imagined, putting their mission - and survival itself - in serious jeopardy. Kurt Russell leads an all-star cast, including Patrick Wilson, Matthew Fox and Richard Jenkins in this gritty, brutal adventure chronicling a terrifying rescue mission in the Old West. To enter is simple. Simply e-mail me the answer to the skill testing question that follows. Correct answers will be entered into a random draw. One (1) wnner will receive one (1) poster signed by cast and crew of Bone Tomahawk. At what well known genre film festival did Bone Tomahawk have it's World Premiere? The contest is open to U.S. resident only and we will take entries up to midnight on Thursday, January 7th (PST). i actually shed a tear when i saw that this was up for grabs. 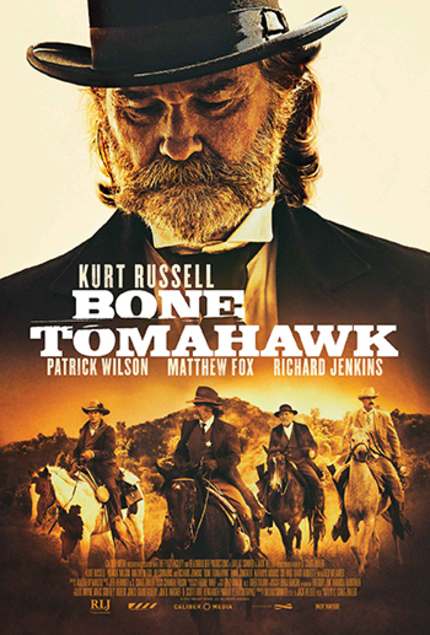 Awwww who do I have to kill/bribe/screw to get a Bone Tomahawk poster signed by Kurt Russell?